2016/17 threw up a lot of surprises, but one of the biggest was the identities of the clubs promoted from the Championship into the Premier League. Sure, people expected Newcastle United to get back up to the top division – after all, they’ve got history, including title challenges and Champions League runs in the Premier League era – but the other two clubs to make it up the ladder were Brighton & Hove Albion and Huddersfield Town – two clubs who’ve never made the Premier League before. Will they be able to stay up and establish themselves as Premier League regulars, as the likes of Swansea and Southampton have done? Or will they end up as part of the so-called “yo-yo club” with the likes of Sunderland and Middlesbrough? Who knows. Since the Premier League started in 1992/93, there have been 49 different clubs competing in the division, including the upcoming season’s new boys. But with this being the 26th season, it’s easy to forget about some of the clubs who we’ve seen in there, especially if they’ve withered away since. Here are five clubs you probably forgot – or didn’t know – played in the Premier League. 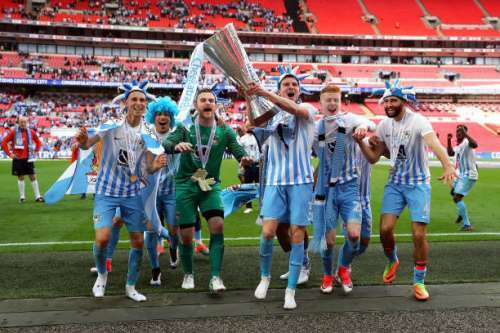 If you’re a younger fan, you’d probably be amazed to know that Coventry City – relegated into League Two last season after finishing 23rd in League One – ever played in the Premier League. They’re currently more well-known for being one of the worst-run clubs in England thanks to the stewardship of shady hedge fund SISU, and have to share their ground with new owners, Rugby League side Wasps. As a matter of fact though, the Sky Blues were actually Premier League mainstays back in the 90s. They were one of the founding clubs of the Premier League in 1992 and although they always struggled – surviving on the final day of 1996/97 thanks to a win over Tottenham – at times they also provided some real high points. 1997/98 saw them finish 11th in the Premier League with one of the best home records in the division, and they also had the league’s joint top scorer in Dion Dublin. 1999/00 meanwhile saw them feature the likes of Robbie Keane, Gary McAllister and Mostapha Hadji as they finished 14th but famously defeated Arsenal 3-2 on Boxing Day. Unfortunately for Coventry their luck ran out in 2000/01 and they were relegated into the Championship. And since then it’s gone from bad to worse as they’ve seen administration and a further two relegations. Today they’re about as far away from the Premier League as it gets.